DAVIE, FL – Eight months after the mass shooting at Marjory Stoneman Douglas High School, acclaimed documentary filmmaker Charlie Minn has finished his searing film about the tragedy. 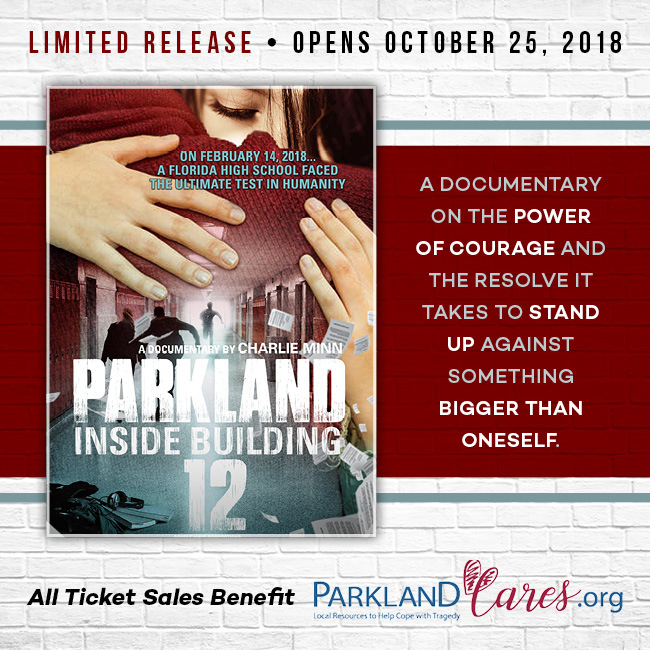 Minn will be at the Paragon Ridge Theater on Friday, Oct. 12, for a private screening of Parkland: Inside Building 12 – open only to South Florida media, community leaders and the MSD community. Paragon Theaters are donating all of their ticket proceeds of the week-long run to Parkland Cares, a local non-profit dedicated to raising funds and awareness for mental health and trauma counseling. The media today has shamelessly given most, if not all, of their coverage to the attention-seeking perpetrators of mass-shootings, like the Parkland killer. For the average person who follows the news, ask them to name the Parkland killer, and they will go 1 for 1, then ask them to name one person shot in Parkland, and they will probably go 0 for 34. I am trying to change this entire dialogue. That philosophy led Minn to never name the Parkland shooter in his documentary. If you agree or disagree with his decision – or anything else in the documentary – Minn welcomes the discussion at 7:30 p.m. on Friday, Oct. 12. To attend contact Niki C. Wilson at [email protected]. Parkland: Inside Building 12 will begin its South Florida run on Oct. 25 at the Paragon Ridge and Paragon Coral Square. To purchase tickets for the limited showing, please visit Paragon Theaters online. To see the eight-minute trailer, go to www.insidebuilding12.com. ABOUT PARAGON ENTERTAINMENT HOLDINGS: Paragon Entertainment Holdings, headquartered in Deerfield Beach, Florida, was established in 2009 to create a differentiated movie going experience that is superior to traditional movie theaters in comfort, technology, and amenities while still retaining a competitive price point. Paragon’s model of luxury made affordable includes such amenities as expanded food offerings, reserved electric luxury recliners with footrests, bar/lounges, HD digital projection, and superior customer service. Visit paragontheaters.com for theater locations and showtimes.